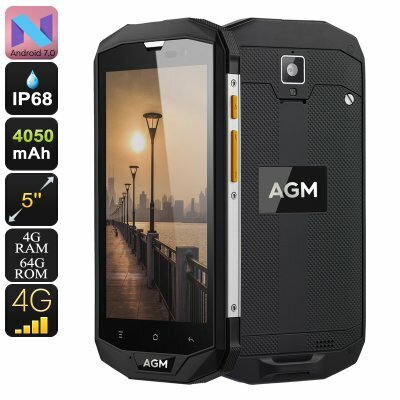 Successfully Added AGM A8 Rugged Smartphone - Android 7.0, Quad-Core CPU, 4GB RAM, Dual-IMEI, 4G, NFC, OTG, 5 Inch Display, 13MP Camera to your Shopping Cart. Stay connected anywhere you go with the AGM A8 rugged phone. This Android smartphone features Dual-IMEI numbers. Thanks to this, you’ll be able to easily separate work and private life. Additionally, it supports 4G. No matter whether you’re at home or in the outdoors, you’ll always be able to browse the web and stay connected. Your Android phone comes with an IP68 design. This makes your rugged phone extremely tough and allows you to use it in rough environments. It is resistant against water, dust, and drops. No matter what you throw at this Android phone, nothing will stop it from working. The AGM A8 rugged smartphone runs on an Android 7.0 operating system. You will be able to enjoy the latest software features and undergo a smooth user experience. Whether you like to play games, watch a movie, or browse the web – nothing is too much for this Android phone. On its 5-Inch HD display, you’ll be able to enjoy all media in crisp resolution. Thanks to the latest IPS technology, you’ll be treated with vivid colors and high detail from any viewing angle. Its 4050mAh battery lets you enjoy your media for hours in a row. With this cell at your side, you no longer have to worry about draining your battery. Packed within the IP68 waterproof body of this rugged smartphone, you’ll find a Quad-Core processor. This CPU has been clocked at 1.2GHz and brings along quite some power. Along with the phone’s 4GB of RAM, you’ll be able to multitask and enjoy demanding media. 64GB of internal storage offers plenty of space for you to save your latest downloads. For those of you that need even more, the Android phone holds a 32GB SD card slot. You can simply head out to the Play Store and freely acquire millions of games and applications. With this much memory at your side, you’ll never have to worry about storage issues again. At the rear of this rugged outdoor phone, you can find a 13MP camera. This piece of equipment lets you shoot stunning images and video of all your upcoming adventures. For all smartphone photography lovers out there, this phone surely brings along plenty of possibilities. You’ll be able to head out and snap pictures of all those special moments in life. Once you’re back home, you can share your previous adventures with friends and family and make sure that not a single memory ever gets lost again. Arabic: - وعرة الروبوت الهاتف - Chinese Simplified: - 坚固耐用的 Android 手机 - Czech: - Robustní telefon Android - Danish: - Robust Android telefon - Dutch: - Ruige Android telefoon - French: - Téléphone Android robuste - German: - Robustes Android-Handy - Hebrew: - טלפון אנדרואיד מחוספס - Hindi: - बीहड़ एंड्रॉयड फोन - Italian: - Telefono Android robusto - Japanese: - 頑丈なアンドロイド携帯電話 - Korean: - 견고한 안 드 로이드 전화 - Malay: - Telefon Android yang lasak - Norwegian Bokmål: - Barsk Android telefon - Romanian: - Accidentat de telefon Android - Russian: - Прочный телефон Android - Spanish: - Teléfono Android resistente - Thai: - โทรศัพท์มือถือทนทาน - Turkish: - Engebeli Android telefon - Vietnamese: - Điện thoại Android gồ ghề. the product is what you were expecting.